Finishing touches and cleaning, only 50 people left on the former construction site. That’s the stage at which Widzew’s new stadium is nowadays, just two weeks before official handover to the municipal authorities. General contractor Mosty Łódź confirmed the building is ready, already approved by the fire department and public health office, the police department should approve it in mid-February, a month before the first major event. One thing still missing is the approval for use from the construction supervision office but it’s days rather than weeks away. 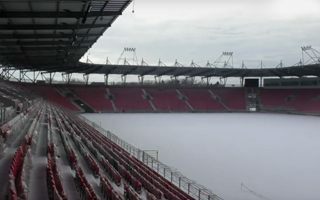 Mosty Łódź plan to hand the stadium over to the Łódź municipality on February 3, over 2 months after the initial plan (late November). Even so, the 18,000-seater is finished in a timely fashion, in well under 2 years. First game of Widzew Łódź is expected to take place on March 18, against Motor Lubawa. You may not know the rival, most people in Poland don’t. That’s because Widzew are rebuilding their once-great position from the very bottom after bankruptcy, now in the 4th league. Still, the game scheduled for 19:10 (hour representing the date of Widzew’s birth as a club) might fill all available seats. In an unprecedented surge in Polish football the team’s supporters have already bought nearly 7,500 season tickets (one of the highest numbers in all leagues), not minding the current low level.